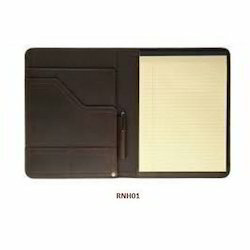 - Chit pad holder is beautifully designed and can have a brand logo on its each side. - It’s made from virgin quality sturdy plastic and can be made in colors of your choice. - Chit pad holder is an ideal brand reminder gift. 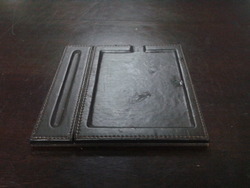 Table top memo pad holder in leatherette. This item can be made as per your requirements of any size, quality and printing. We offer a wide range of slip pad holders made in wood. These holders are light weighted and easily movable. We bring for our clients a wide range of Office Accessories Set. The range of accessories offered by us is highly in demand because of their creative design .Its made on high quality MDF base and handpainted a combination of balck and white.We can also customize in different combination as per our customers requirement.